Staff are friendly enough but it has been as with many Youngs pubs gastrofied (not quite as badly as the Orange Tree perhaps) and is a de facto restaurant now as others have said. But this is Richmond and times change so whilst I'm not happy about that it is largely inevitable I guess and at least it's still open. A pleasant stay here after a tiring walk round Kew gardens. At the back is a patio area where I had a welcome pint of Youngs London ale. Inside the d�cor is smart wood panelling. I would agree with previous reviews about it being as much of a restaurant as a pub. Although I can imagine things get quite loud when the rugger boys from London Welsh are around. There was a bit of a delay with the food, (menu printing problem), but it was well worth the wait. Haddock with chips the size of Snickers bars. The staff were most friendly and made sure I was kept abreast of the menu situation. Has completely metamorphosised itself and its target audience since a substantial refurbishment. Good beer and very good Bloody Mary as well! Go for the excellent sausage rolls or scotch eggs - am yet to try the food. 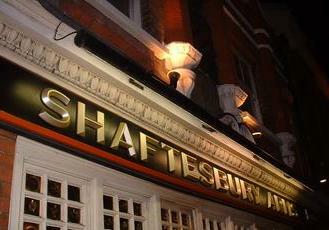 On a road where once there were three pubs to choose from, the Shaftsbury is the last one standing. Gone is the sticky carpet floor and the weathered looked replaced by something brand spanking new but lacking atmosphere. It seems to be more a restaurant with a bar in it than a pub. The guy who served me was enthusiastic about the place (I think he was the manager) and there was good selection of ales. It just left me a bit cold and out of pocket as the beers were a bit pricey. It is getting harder to find old fashioned boozers these days. Shame.